Over a career that takes in almost two decades with Dead Can Dance, award-winning movie soundtracks and a series of acclaimed solo and collaborative albums, Lisa Gerrard has established herself as one of Australia&apos;s most ground-breaking and in-demand artists. Lisa is a composer, vocalist and instrumentalist. 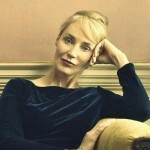 Lisa has recorded nine albums with Dead Can Dance, numerous solo albums and scored countless films. She has collaborated with many of the world&apos;s leading artists such as; Hans Zimmer, Daniel Johns, Ennio Morricone and Russell Crowe.